Then the people began arguing with each other about what [Jesus] meant. "How can this man give us his flesh to eat?" they asked. So Jesus said again, "I tell you the truth, unless you eat the flesh of the Son of Man and drink his blood, you cannot have eternal life within you. But anyone who eats my flesh and drinks my blood has eternal life, and I will raise that person at the last day. For my flesh is true food, and my blood is true drink. 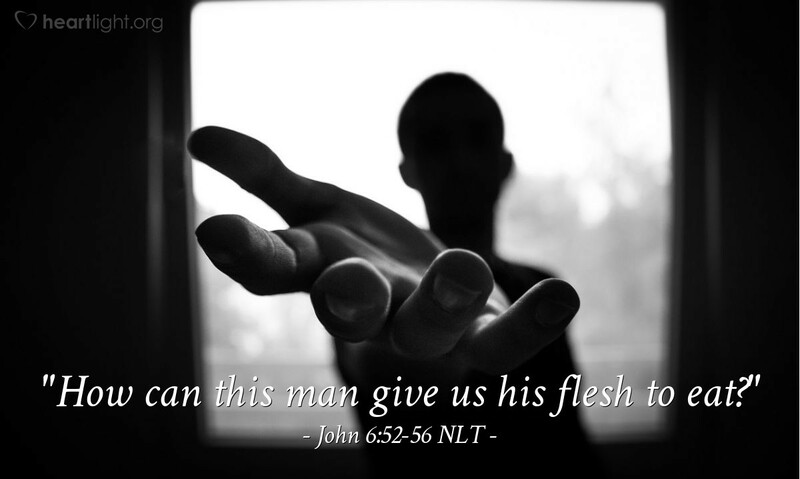 Anyone who eats my flesh and drinks my blood remains in me, and I in him." Jesus didn't make things easy for folks to follow him. We sometimes forget his demands on us. We live in a time when so much "bait" is used to try to attract people to Jesus. Chapter 6 of John reminds us that Jesus challenged the pre-conceived and small-sized notions people had of him and pushed them to make an all-or-nothing decision about his identity and importance. He would not allow himself to become simply a miracle-making hero of the masses. Instead, he challenged the people of his day either to follow him with everything they had or to reject him and turn away. The same challenge is for us as well, if we are honest with ourselves! Jesus is either everything God intends for us, or he is a dangerous lunatic to be rejected. Which will it be for us? Jesus refuses to be just our kind religious leader; he challenges us to see him as our life and our sustenance. The question is not only whether we believe this, but also whether we live with this conviction as a reality in our daily lives! Father, I confess that I often want my discipleship made easier. I find I often want your truths to be more easily understood. I love Jesus with all my heart; but for some reason, I find myself not depending on him as my life and my sustenance. Father, please don't just forgive me, but give me a deeper hunger for your living bread in my life. Feed me with his life as I seek to place him first in all I do. In his name, Jesus Christ the Lord, I pray. Amen.